The Rockers have signed former Major League pitcher Seth Maness. The right-hander marks the first player with big league experience signed in the franchise’s history. Maness spent five seasons in the Major Leagues, including four with the St. Louis Cardinals (2013-16) and one from the Kansas City Royals (2017). The Barnstormers have re-signed four players from their 2018 squad, including pitchers Scott Shuman, John Anderson and Jared Lakind, along with outfielder Darian Sandford. Shuman was 2-0 with a 0.98 ERA in 29 appearances last summer before his contract was purchased by Oaxaca of the Mexican League in early August. He later returned for the playoffs. Anderson was 6-3 with a 3.54 ERA in 34 games, of which 12 were starts. Lakind went 2-3 with a 3.83 ERA while walking only 13 and yielding just two home runs in his 42.1 innings of work. Sandford is coming off a record-setting season in which he stole 82 bases for the Barnstormers, shattering the previous single season mark of 55, set by Quincy Foster in the inaugural season of 2005. The club also signed outfielder Destin Hood and infielder/outfielder Zach Shank. Last year, Hood hit a combined .222 with 15 homers and 56 RBI between Class AAA Round Rock and Class AA Frisco in the Texas Rangers system. Shank, a local product from Warwick High School, signed with Seattle as the Mariners’ 28th round draft pick in 2013. After putting together a strong season at the Class A level in 2014, Shank reached Class AAA Tacoma by the middle of 2015. The Ducks re-signed right-handed pitcher Tyler Badamo. The Long Island native split time in the Atlantic League during the 2018 season with the Ducks, New Britain Bees and Sugar Land Skeeters. He combined to post a 5-6 record with a 4.12 ERA, 53 strikeouts and 20 walks in 83 innings of work over 16 appearances (15 starts). The Bees announced the return of pitcher Kyle Simon and the addition of pitcher Cory Riordan as the club’s first two signings of the 2019 season. Simon returns to the Bees for his fifth season in the Atlantic League and fourth in the Hardware City. Last year, the right-hander made 24 appearances (23 starts), recording eight wins with a 4.31 ERA, 93 strikeouts, two complete games, and one shutout over the course of 144.0 innings pitched. Riordan makes his way to New Britain for his fourth season in the Atlantic League. The Connecticut native pitched for the Somerset Patriots last year, making 14 starts and earning three victories with a 3.13 ERA and 62 strikeouts across 83.1 innings pitched. 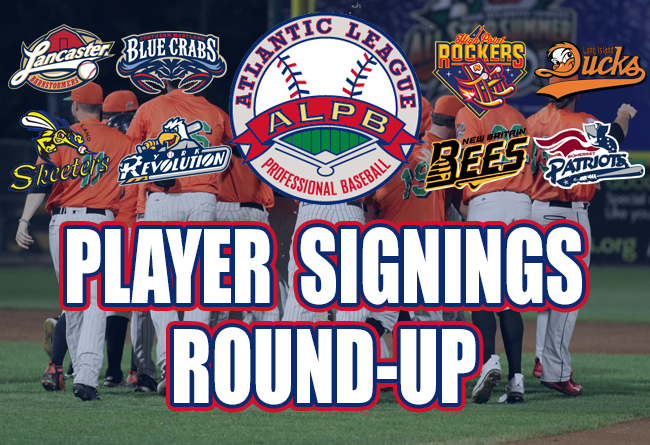 The Patriots announced that they have re-signed a trio of players from their 2018 squad, including infielder Craig Massey, infielder/outfielder Mike Fransoso and pitcher Nate Roe. Massey led the league in batting last year with a .338 average, becoming just the fourth player in team history to win a batting title. He also led the league in on-base percentage (.418), ranking as the only qualified batter in the league with an OBP above .400. Fransoso hit .267 with two home runs, 46 RBI and 24 stolen bases over 120 games in his first campaign with Somerset last year. He finished the season seventh in the league in walks (62), tied for seventh in games, 10th in steals and 13th in on-base percentage (.371). Roe ranked fourth on the Patriots with 48 appearances (two starts) last year and led all relief pitchers on the team with 59.1 innings pitched. He finished the season with a 5-3 record and a 4.55 ERA in his first stint with the Patriots. The Blue Crabs have signed right-handed pitchers Luis Chirinos and Miguel Nunez. Chirinos was signed on July 4, 2006 by the Florida Marlins as a non-drafted free agent. He went on to play in the Marlins organization for four years before making his way to the world of independent baseball. He also spent the 2014 season in the Los Angeles Dodgers organization. Nunez has spent a majority of his playing career in the Philadelphia Phillies organization. He reached as high as the AA affiliate for the Phillies, the Reading Fighting Phils, in 2016. Nunez posted a career best 3.11 ERA in his 45 games that season in a Fighting Phils uniform. The Skeeters have announced the return of pitcher Lucas Irvine while adding former Major Leaguer pitchers Mark Lowe and David Holmberg. Irvine made his Skeeters debut in 2018, going 1-1 with a 3.41 ERA through six starts. He also made two starts in the 2018 postseason, going 1-0 with a 2.89 ERA en route to the Skeeters’ 2018 Atlantic League Championship. Lowe spent 11 seasons in the Majors as a reliever, appearing with the Seattle Mariners (2006-10, ‘15), Texas Rangers (2010-12), Los Angeles Angels (2013), Cleveland Indians (2014), Toronto Blue Jays (2015) and Detroit Tigers (2016). The Houston native went 10-27 with a 4.22 ERA (385.2 IP) and six saves through his Major League career. Holmberg made his Major League debut with the Arizona Diamondbacks in 2013 and has also appeared at the Major League level with the Cincinnati Reds (2014-15) and the Chicago White Sox (2017). Over four Major League seasons, Holmberg is 5-10 with a 5.49 ERA through 51 appearances (19 starts), spanning 119.2 innings pitched. The Revolution have re-signed infielder Henry Castillo while adding pitcher Dan Minor and catcher Carlos Paulino. Castillo impressed in 44 games with York in 2018 after joining the team in July. The switch-hitter batted .310 with nine doubles, three triples, two home runs, and 22 RBI while seeing time at second base, third base, and shortstop. Minor spent his first four seasons in the Houston Astros farm system. The righty led the Appalachian League with a 2.75 ERA and a 1.03 WHIP in his rookie season in 2012 and went a combined 17-6 over the following two seasons at Class A and High-A. The 28-year-old went 11-2 with a 2.51 ERA in 15 starts for Gary in the American Association last season, allowing just 87 hits and 19 walks with 77 strikeouts in 97.0 innings. Paulino has spent six seasons at the Triple-A level, having played in the Miami Marlins, Pittsburgh Pirates, and Minnesota Twins organizations. The Dominican Republic native played in the Mexican League with Oaxaca last season, batting .276 with two home runs and 22 RBI in 33 games.